A cross-section of mouse spinal cord tissue showing cells in which the CRISPR-Cas9 gene has been expressed (green). 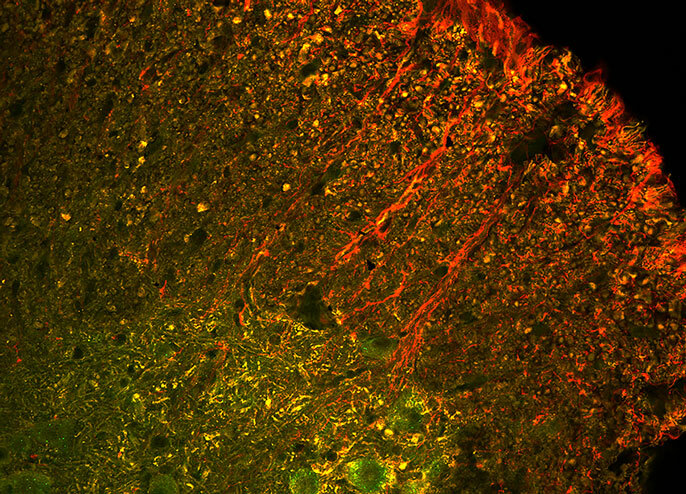 The Cas9 gene has been successfully inserted into motor neurons (yellow), rescuing them from death, but not the support cells called astrocytes (red). The UC Berkeley team is now developing improved viral vectors to insert the Cas9 gene into astrocytes so that their death does not also kill surviving motor neurons.